When it comes to virtual plumbers, PlayStation has forever been in the shadow of Nintendo and a certain big-boned Italian. Yet for one glorious moment in late 2003, PS2 was treated to a toilet jockey who could not only rub shoulders with Mario, but who’d happily kickstart a bloody Mushroom King coup. Meet Chris Stone and Freedom Fighters – a badass resistance leader in an equally badass squad shooter. Now, a swift look at IO Interactive’s CV will quickly reveal a résumé heavily focused on chrome dome contract killing. Any output from the Danish dev that doesn’t revolve around Agent 47 has usually been a bit, well... bobbins. It’s at this point the prosecution would kindly point the jury towards Kane & Lynch. But when the studio partnered with EA on an alternate reality, squad-based shooter, all that changed. 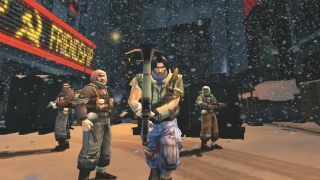 Set in a world in which the Soviet Union won World War II by dropping an A-bomb on Berlin, the game opens with dastardly Russian forces invading New York. Within the space of five minutes, you’re whisked away from unclogging crappers on a routine plumbing job to start ducking for cover, as shots ring out on the streets of Manhattan and dozens of New Yorkers scurry past in terror. As a way of contrasting the banal with the bombastic, it’s a superb opening statement full of intent. Originally envisioned as a quasi-turn-based strategy, IO thankfully saw sense and used its Glacier Engine to develop a third-person blaster focusing on hefty shooting. Much may be made of the impact Resident Evil 4’s brilliant gunplay had on the industry, but Freedom Fighters was proudly rocking a competent over-the-shoulder aiming system a full year before Leon S Kennedy’s Spanish horror show. It’s unlikely, of course, that Freedom Fighters would still stoke those nostalgic fires so fiercely if it was just a solid early noughties shooter – no offence, Conflict: Desert Storm 2. As Chris evolves from plunger ninja to the Freedom Phantom, he learns to lead a ragtag bunch of civilian-turned-guerrilla-warriors. Commanding troops to attack Soviet forces or provide cover-fire is both elegant and effective – this in an era when most console shooters were terrified of tactics. Freedom Fighters proved the studio could also pace a more structured adventure than Hitman with great assurance. With different seasons shifting from baking Big Apple afternoons to frigid firefights in Times Square, there’s a real sense of time elapsed. And once you storm Governors Island in a swirling blizzard, the thumping strings of Jesper Kyd’s score fuelling your efforts to liberate New York, it’s hard not to be taken in by the spectacle. Sadly, Freedom Fighters sold like diamond-studded tiaras at an anti-gentrification rally, with Chris and his rebellion shifting just over half a million copies on PS2 worldwide. IO had planned a sequel, but it was shelved to focus on Kane & Lynch (boo! ), then later Hitman: Blood Money, Absolution, and Hitman 2016. The developer has since said it only has the resources to work on games starring Agent 47, which is a crying shame. With seemingly little hope of a Freedom Fighters 2, we’d settle for the excellent original finding a spruced-up home on PS4 to join the ever-growing ranks of emulated PS2 hits. C’mon Sony, don’t let the resistance be futile.